The recognition banquet an opportunity for a night of fellowship and great food as we acknowledge and thank our adult volunteers for the hard work and dedication that made this year incredibly successful. 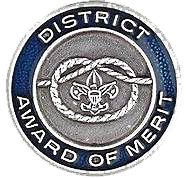 Arrowmoon District’s outstanding leaders at the unit and district levels will also be recognized. All volunteers in Arrowmoon District are invited. Tickets to the banquet are $7.50. There is no charge for the class of 2017 Eagle Scouts. The deadline to order tickets is at 5:00 pm on January 20, 2018. Order tickets online with credit card, electronic check or PayPal. Council refund policy. Thrives on Planning Fun Programs? Lives by the Scout Oath and Law? Makes a Difference with our Youth? Nominate Scouters who have served Arrowmoon District youth above and beyond the call of duty. Nominations may be turned-in at January Roundtable. The deadline for submitting nominations is January Roundtable. For late-breaking news and announcements, join our district Facebook page and sign up for our district e-mail list. For questions, contact the District Dinner chair or district activities chair.